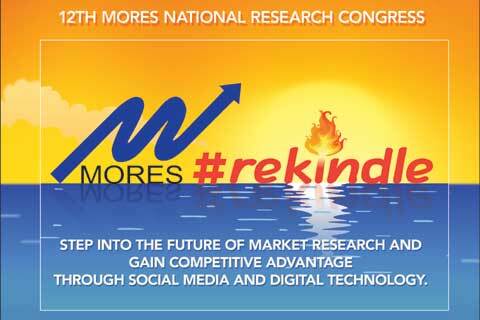 Experts from top foreign market research firms will be leading this year’s National Research Congress happening on March 5-7, 2014 in Boracay. Registration is ongoing. Experts from top foreign market research firms will be leading this year's National Research Congress, an annual market research confab spearheaded by The Marketing and Opinion Research Society of the Philippines (MORES). 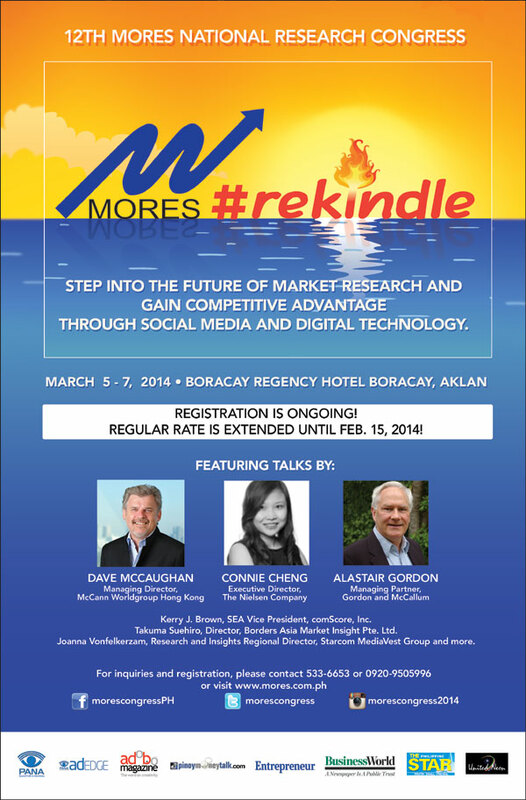 Headlining the 2014 MORES National Research Congress, happening on March 5 to 7, 2014 at the Boracay Regency Hotel in Boracay, Aklan, are market research experts and key personalities from leading multinational research companies such as McCann WorldGroup, The Nielsen Company, Gordon & McCallum and more. Leading the highly influential roster of speakers, who will be sharing the latest trends and innovations in the field of market research and will also be giving valuable insights on how to leverage social media and digital technology, are Alastair Gordon from Gordon & McCallum and Connie Cheng from Nielsen Southeast Asia. A partner at Gordon & McCallum, a world-renowned business consultancy firm, Gordon is a highly experienced international market research professional with a remarkable stint at Nielsen Corporation, where he drove the development and implementation of major research services in areas such as brand health, consumer decision-making and shopper insight research. He is also well regarded as a trainer and speaker on research topics and has delivered papers and seminars to clients and industry forums around the world. Cheng, meanwhile, helms Nielsen’s Shopper practice in Southeast Asia, North Asia and Pacific. A Nielsen veteran and an Economics degree holder from the University of London, Connie is responsible for growing the Shopper business regionally - delivering shopper insights and capabilities to help clients successfully convert consumers into shoppers. She also has extensive experience in strategic thinking, business planning and research execution in both domestic and international marketplaces. Joining them at the event as speakers are Dave McCaughn of McCann WorldGroup Hong Kong, Takuma Suehiro of Borders Asia Market Insight and Joanna Vonfelkerzam of Starcom MediaVest Group. Also attending the gathering as keynote speaker is Aklan Governor Hon. Florencio Miraflores, who will be officially opening the three-day event. 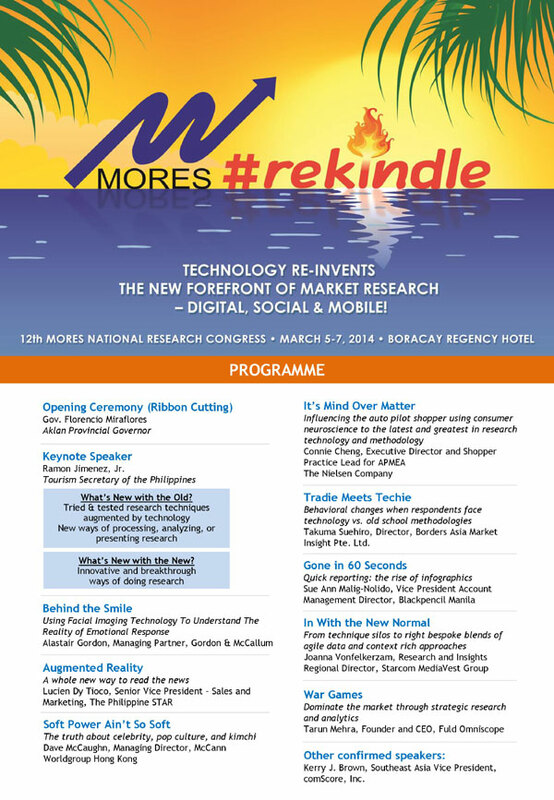 Registration for 2014 MORES National Research Congress is still on going. Regular rate has been extended to February 15, 2014. For inquiries, please contact (+632)533-6653 or visit www.facebook.com/MORESCongressPH.